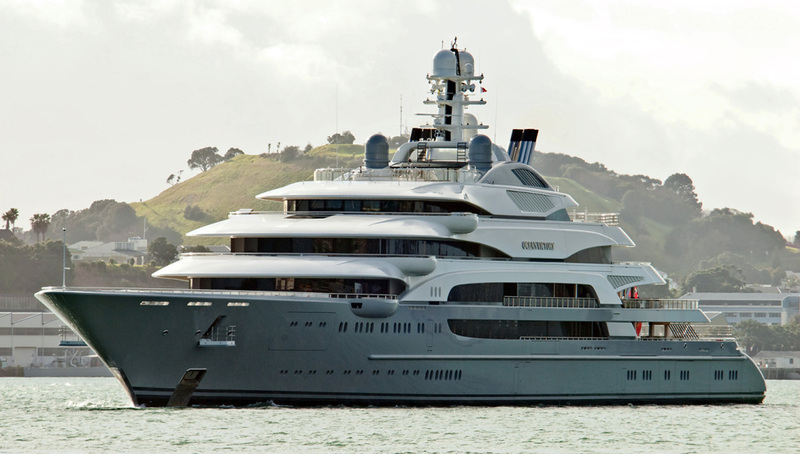 Stately Eclipse, the 162-metre yacht delivered to billionaire Roman Abramovich, took five years to design and build. 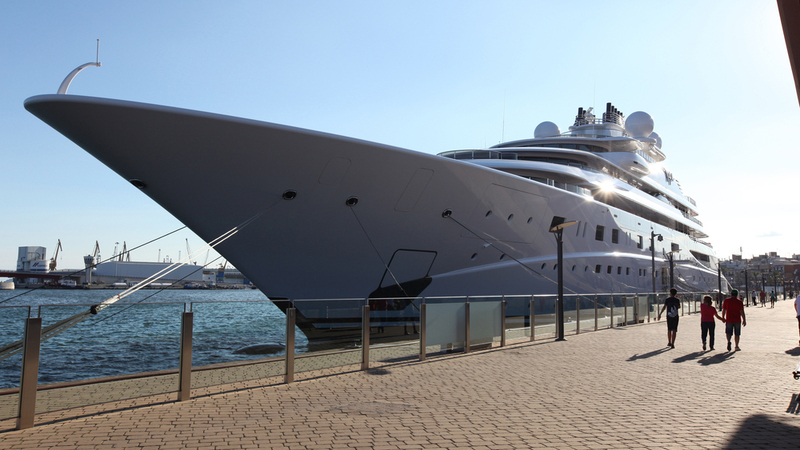 When it left the Blohm + Voss shipyard in Hamburg in 2010, it was the world’s largest yacht. 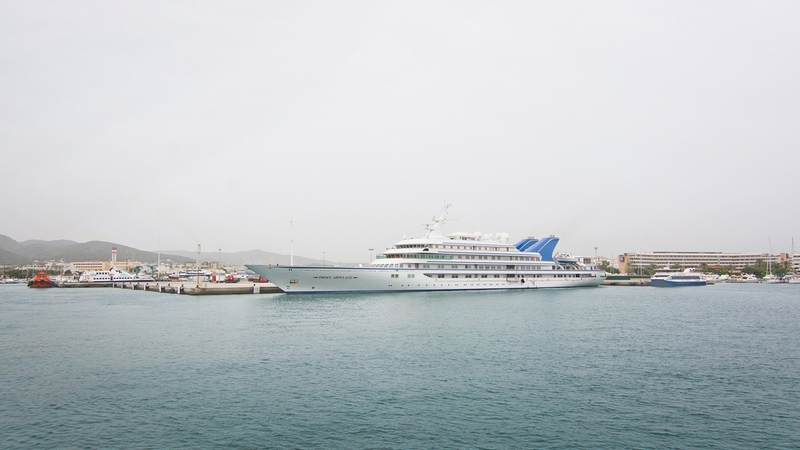 The interior has 17 staterooms and a palatial master suite, with the capacity to carry 85 crew. The Terence Disdale exterior has a proportional profile, with tiered decks that sweep upward and bend ever so slightly at the aft ends. 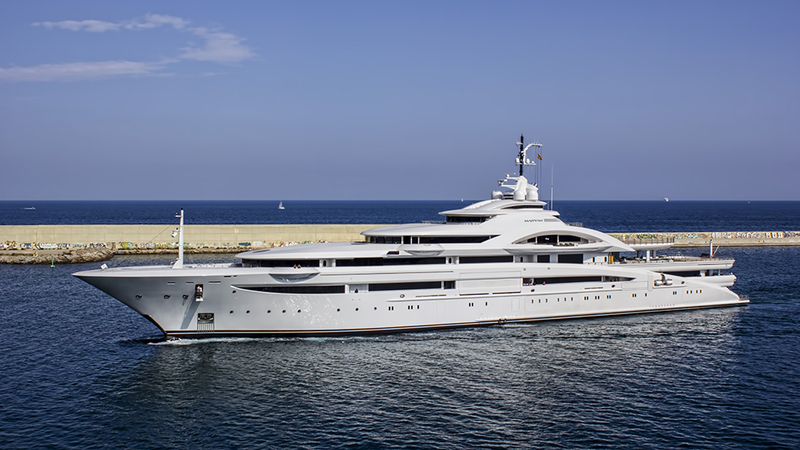 Eclipse has a 56-metre-long owner’s deck and, at the time of its launch, the largest swimming pool on any superyacht (the bottom raises and converts to a dance floor). 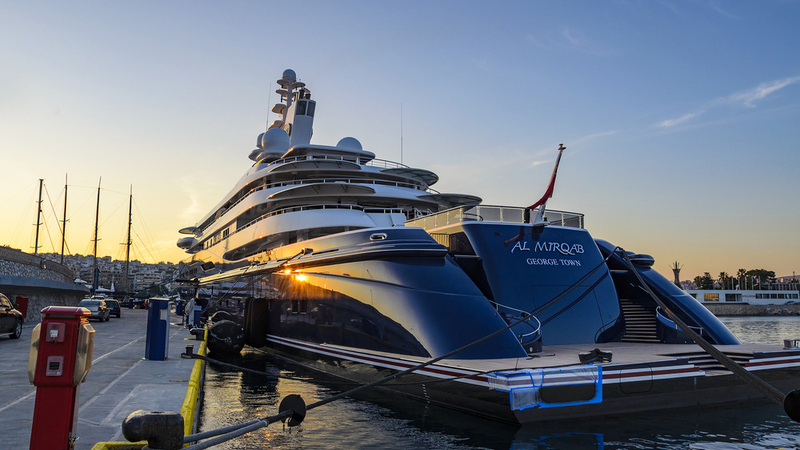 Other features reflecting its stature: the capacity to hold three helicopters, including one in its belowdecks hangar, a sophisticated stabilisation system, and an enormous spa, gym, and beach club. 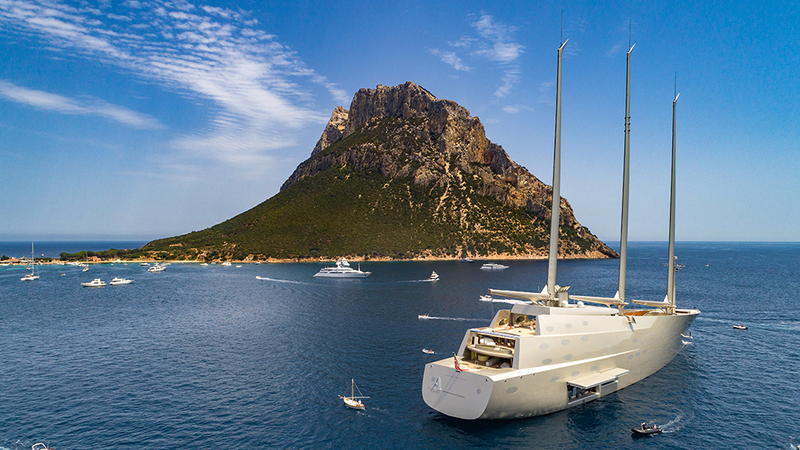 Hybrid diesel-electric engines are connected to Azipod drives that give Eclipse a top-end speed of 21 knots, with a range of 6000 nautical miles. 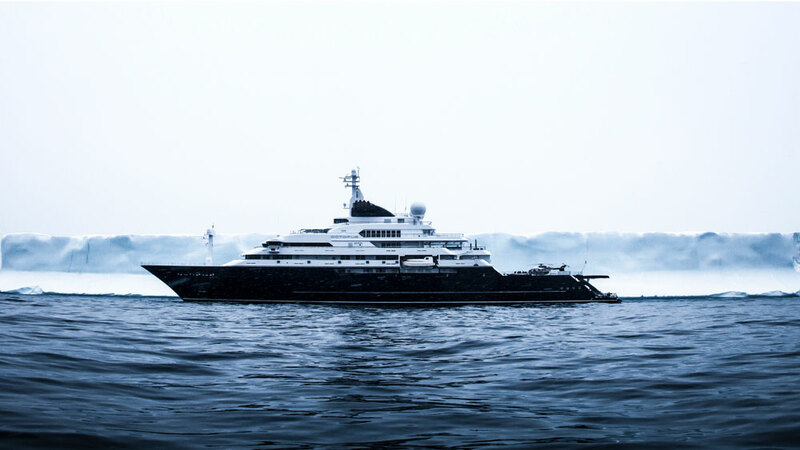 This Andrew Winch design was originally commissioned for Prince Jefri Bolkiah of Brunei as a joint project between Blohm + Voss and Lürssen, before it was halted in 1998 with just a bare hull and skeletal superstructure. 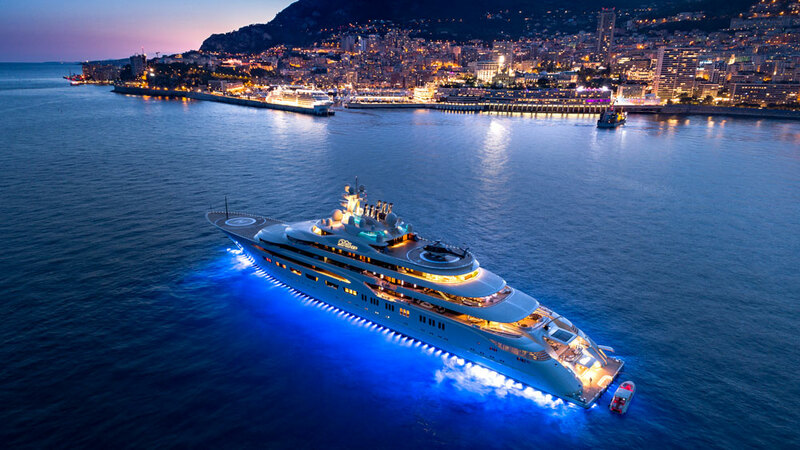 The hull was sold to the government of Dubai, and, under the direction of the country’s ruler, Sheikh Mohammed bin Rashid Al Maktoum, work on the 162-metre began again, though this time by Platinum Yachts. 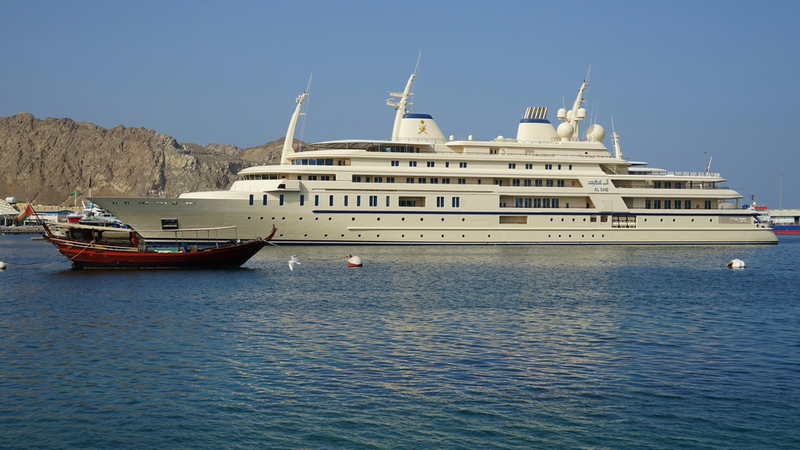 Dubai is now the sheikh’s royal yacht, with accommodations for 24 guests and quarters for 88 crew. It has an impressive 70-foot-wide atrium, landing pad for a Black Hawk helicopter, submarine garage, disco, and cinema. Full certification was obtained from Lloyd’s Register in October 2006. 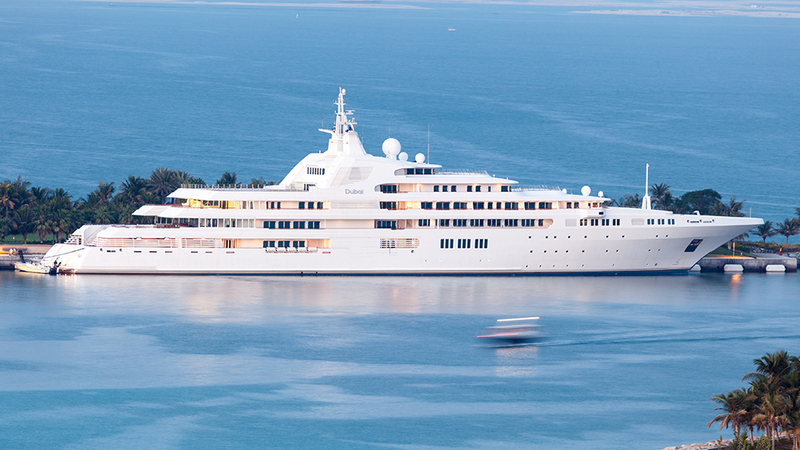 The 2016 launch of Dilbar gave Lürssen the distinction of not only building the longest yacht ever (Azzam), but also the largest in terms of volume. Espen Øino did the exterior, creating a full-bodied superstructure of long, flowing decks, along with two helicopter pads. 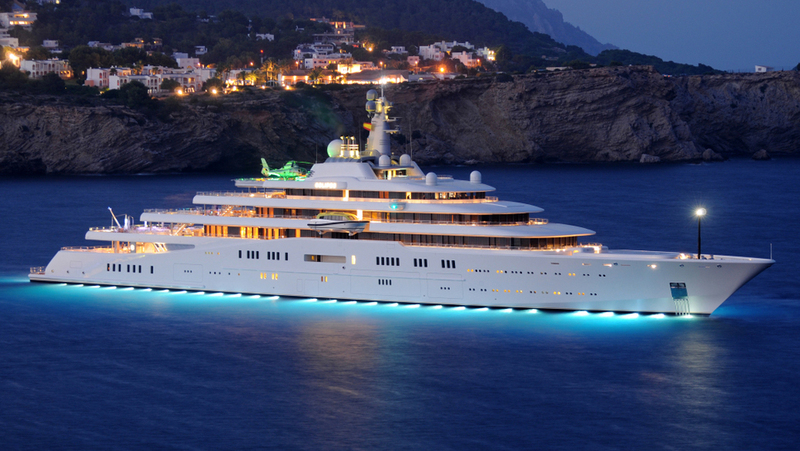 Dilbar also has a 25-metre swimming pool that, according to Lürssen, is the world’s longest on a yacht. The interior by Winch Design is defined by its “rare and exclusive luxury materials,” says the builder, declining to go into detail. 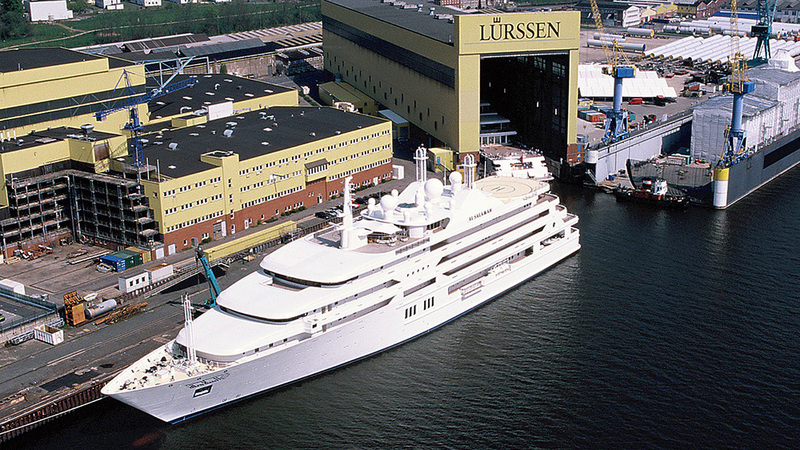 Lürssen added that the world’s largest motor yacht was one of the most complex and challenging yachts ever built, because of its dimensions and technology. Despite Dilbar’s volume, the designers did a masterful job making the yacht look relatively svelte, with no obvious bulges along the length of the hull. El Mahrousa, which means “the protected” in Arabic, is currently Egypt’s presidential yacht, though the 145-metre boat has a separate history as that country’s royal yacht. The London-based Samuda Brothers began the build in 1863, and it was launched in 1865. It was originally built for the Ottoman governor of Egypt, Khedive Ismail, and later carried three Egyptian kings into exile. The yacht was also at the opening of the Suez Canal in 1869. The world’s oldest superyacht has had multiple modifications over the years, including a lengthening by 12 metres in 1872 and another 5 metres in 1905. During the second refit, the owners replaced its paddle-wheel engines with turbine-driven propellers. The yacht, in care of the Egyptian Navy, occasionally goes to sea for a day or two. In 2015, it was used to inaugurate the new Suez Canal. 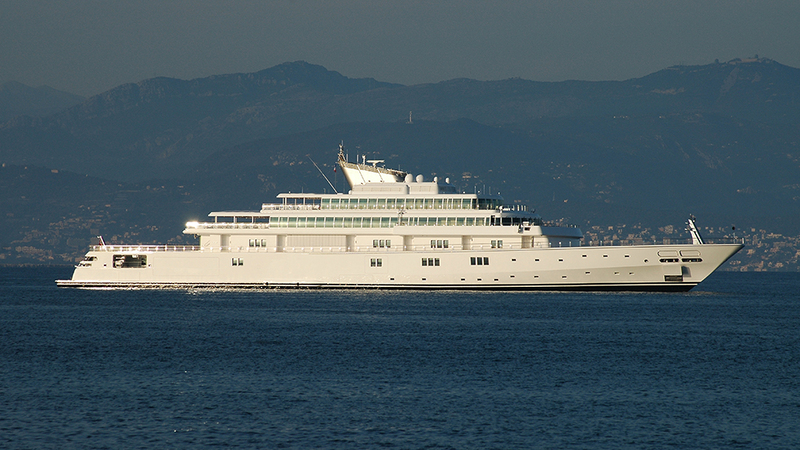 Originally built by Lürssen for Microsoft cofounder Paul Allen, Octopus is the world’s largest expedition yacht. Allen kept all the luxurious features of a superyacht, but wanted Octopus to be able to set anchor at the ends of the earth for exploration. 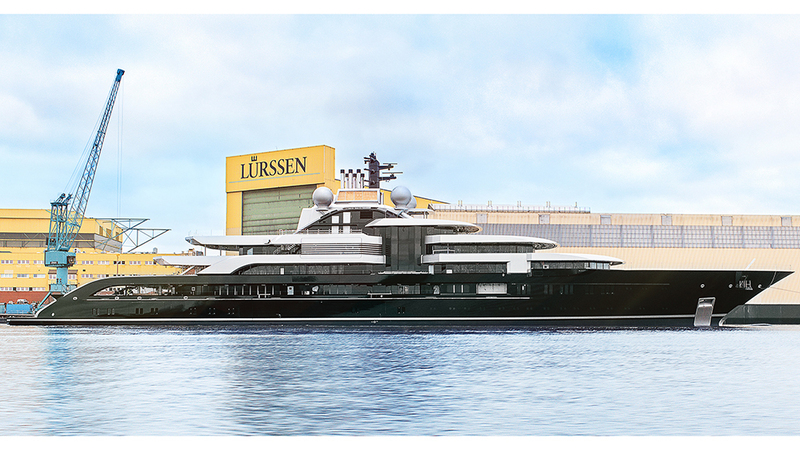 The Lürssen, delivered in 2003, has two helicopter pads and an internal dock that extends through the hull, holding two submarines and an 18-metre tender. The yacht has been involved in multiple exploration discoveries, including a Japanese battleship and the bell from HMS Hood, a World War II battlecruiser. Espen Øino drew the exterior, while Jonathan Quinn Barnett did the interior. 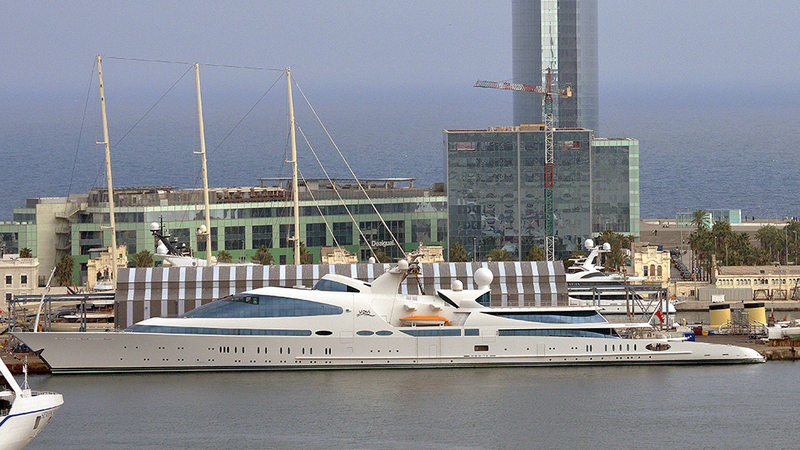 The yacht underwent a refit in 2008. It reaches a top end of 20 knots. Launched in 1931, Savarona was built for American heiress Emily Roebling Cadwallader. 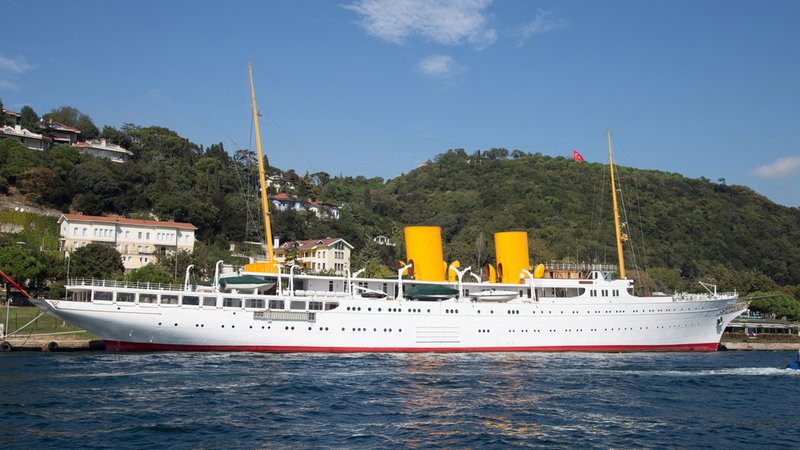 The yacht was eventually acquired by Turkey to be the presidential yacht of Kemal Atatürk, founder of modern Turkey. Jane’s Fighting Ships described the yacht in 1949 as “probably the most sumptuously fitted yacht afloat.” Savarona was later converted to a training ship for the Turkish Navy and, in 1978, destroyed by fire. The yacht laid in tatters for 10 years. 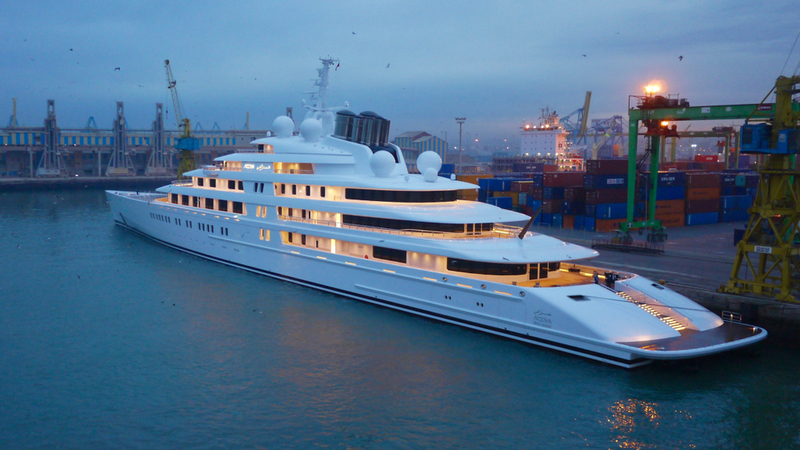 A Turkish businessman spent about $62 million refurbishing Savarona, commissioning Donald Starkey for the interior and replacing the original steam-turbine engines with modern Caterpillar diesels. 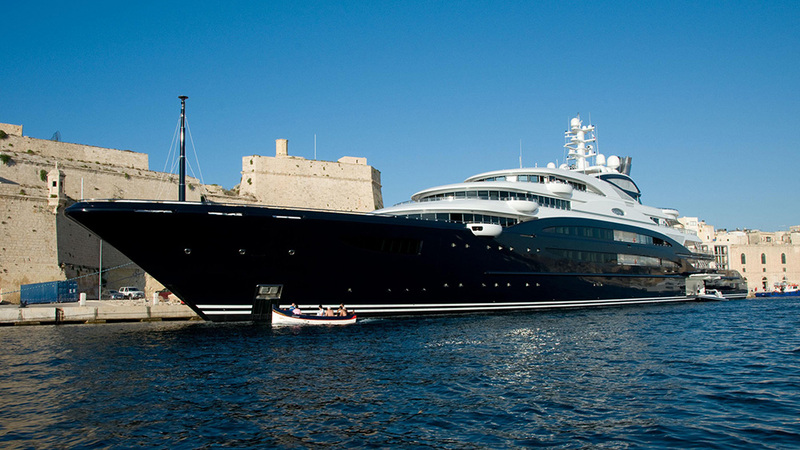 The yacht’s interior was refitted again in 2013, once again becoming the official presidential yacht in 2014. Savarona features a swimming pool, Turkish bath, 85-metre grand staircase, a movie theater, and a library dedicated to Atatürk.